Why is it so hard to make a good Fantastic Four movie? Marvel’s first superteam, that yammering surrogate family of Silver Age aberrations, has now appeared in as many features as it has members, and each film is embarrassing in its own special way. The latest reboot, starring several overqualified actors, isn’t as chintzy as the not-intended-for-release ’90s version, nor is it as throwaway dopey as the two widely mocked Jessica Alba vehicles of last decade. But those adaptations at least had the good sense to embrace the pulpy, light-hearted spirit of their Stan Lee source material. This Fantastic Four, as misshapen as The Thing himself, takes a full hour to even grant its superheroes their superpowers. It’s shockingly humorless and glacially slow for a film featuring a bendy boy genius, an invisible woman, a human torch, and a talking pile of stones. Just eight years after Rise Of The Silver Surfer, here comes the Fantastic origin story again, stretched out like the elastic limbs of Reed Richards. Taking its cues from Marvel’s alternate, Ultimate take on the property, Fantastic Four presents a teenage Richards (Miles Teller), recruited straight out of a high-school science fair to work for Professor Storm (Reg E. Cathey) of the Baxter Foundation. 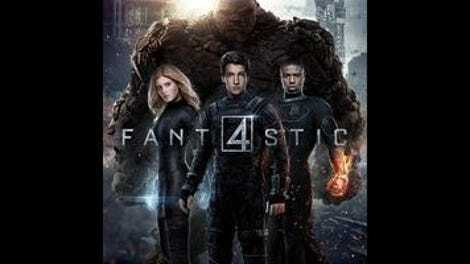 Hustling to crack the key to inter-dimensional travel, the young egghead joins forces with Storm’s industrious adopted daughter Sue (Kate Mara), his impulsive son Johnny (Michael B. Jordan), and bitter fellow braniac Victor Von Doom (Toby Kebbell), an arrogant hacker whose name portends a future in supervillainy. Meanwhile, Reed’s childhood bestie Ben Grimm (Jamie Bell), a neighborhood tough (and nonscientist), patiently waits to be involved for no real reason in the experiment that will transform him into a rock monster. 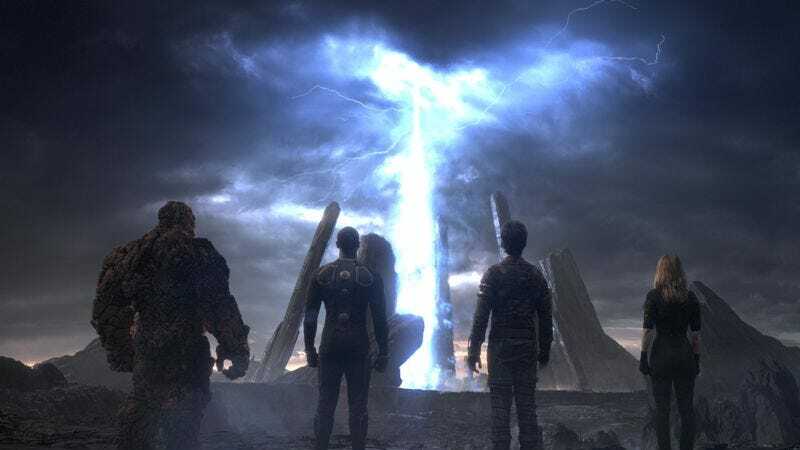 Fantastic Four never really goes anywhere, almost literally speaking: Like a cost-cutting sitcom, it keeps its heroes cooped up indoors, even after they’ve come back from their ill-fated trip to the other side, where some neon green sludge supplies them with their respective gifts/curses. There’s an element of almost-potent body horror to the post-accident scenes—Teller going nightmarishly limber, Mara fading in and out, Jordan constantly combusting, and Bell providing the anguished baritone of a convincing mass of sentient rubble. (The special effects, wildly inconsistent elsewhere, don’t disappoint during this stretch.) And yet none of the Four ever become amazed by their abilities; with the exception of Jordan’s hothead, who seems all too eager to be weaponized by the military, they remain dourly despondent about their situation. It’s an unexpected complaint to lodge against director and co-writer Josh Trank, whose low-budget superhero flick Chronicle—a clear audition tape for blockbuster assignments like this—had a lot of fun with the testing-our-powers portion of the story. Fun, in general, is what’s missing from his first big studio gig. Then again, who knows if what we’re seeing is really what Trank had in mind for Fantastic Four. It’s probably unfair to speculate too much about the behind-the-scenes turmoil the film suffered, except that signs of its troubled production are everywhere, from the multitude of plot holes to the absence of key scenes depicted in the trailer (including what probably would have been the most thrilling action sequence of the movie, a shot of The Thing plummeting from the sky, an affixed camera capturing his descent). And then there’s the film’s ridiculously rushed final act, in which our primary antagonist, one of the most iconic villains in comics history, makes an appearance so belated and inconsequential that it feels like an afterthought. Fantastic Four, awkwardly structured and basically excitement free, is doomed long before he shows up. Better luck next time, true believers.